Lesley Seymour, Dr. Pamela Peeke, Rehana Farrell, Bob Roth, and Candy Crowley speak about meditation and stress. In a standing-room-only crowd of over 350 women professionals, the David Lynch Foundation Women’s Initiative hosted a “Women, Meditation, and Stress” conference at the Paley Center for Media to consider the effectiveness of Transcendental Meditation for healing and empowering victims of domestic violence. The conference also discussed the growing use of TM among women professionals for increasing energy, creativity and focus. In a special segment, panelists presented results of an ongoing partnership with the Mayor’s Office to Combat Domestic Violence (MOCDV) to bring TM to the City’s women and children in need. Based on the early success of this partnership, the Avon Foundation for Women has provided generous funding to bring TM to 50 additional women and children. Yolanda B. Jimenez, Commissioner of MOCDV, received the lifetime of service award for her over 30 years of dedicated effort towards combatting domestic violence. 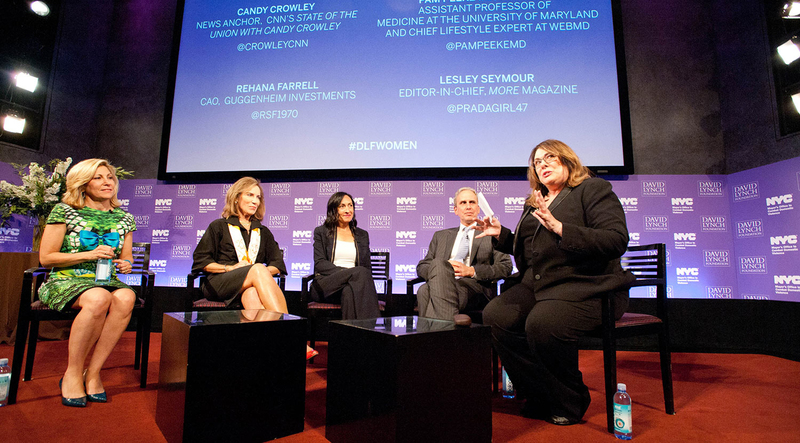 Panel members included women leaders from business, media, education, and social services.